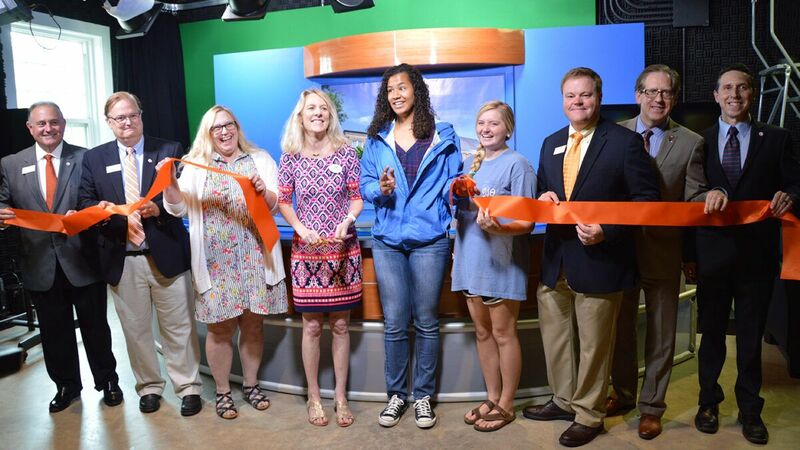 Students and staff gathered in the Campbell TV studio this morning for a ribbon-cutting ceremony celebrating significant upgrades to the studio, courtesy of generous gifts from WTVD. The station donated valuable equipment this summer, including a newsroom desk, pedestals, a monitor and other tools of the trade. The studio upgrade will be used by a variety of classes and programs in the Communication Studies department, but the equipment is particularly beneficial to the students of Campbell Now! 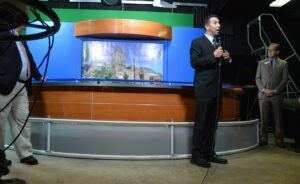 TV, a show produced by undergraduates in which students present campus events, weather and sports news while learning broadcast techniques. Brian Bowman, communication professor and broadcasting overseer, recalled the studio before this summer’s additions. The “set” was a simple green screen, a table and two chairs, which meant that every production had a virtual background. The lighting had to be just right and often slowed things down, but the cost of a real set put it a long way off in Campbell’s future — until WTVD’s donation. Now, the department hopes to increase their live show output from one per week to three per week. As a science professor, dean of the College of Arts & Sciences Michael Wells knows how good lab equipment elevates instruction. The new equipment was put in place by campus operations staff, who constructed a space to mount the set using designs from the communication department. Many students who helped paint and add finishing touches were in attendance, including senior and Wake Up, CU morning anchor Taylor Deckert. Chairman and associate professor J. Dean Farmer and senior and student director Hannah Long also thanked WTVD for their gift, which will give students more real-world practice and open up opportunities to learn to think on their feet. But the staff of WTVD wanted to clarify that they expected repayment of a sort for their donation.